100 Fragen an die Improvisation – 100 questions to improvisation In 3 pilot editions in summer 2011 Gabriele Reuter and Susanne Martin have tested their Salon, which then went on to a long journey through many theaters and studios in Berlin and on tour in the UK. In dialogue with invited guests and the audience these evenings revolve around the phenomenon of Improvisation as performance, choreography and research. 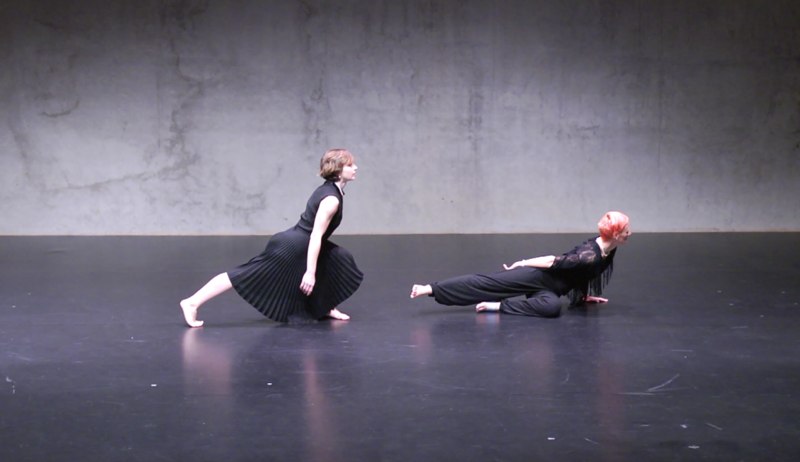 In Autumn 2011 and spring 2012 they continued the Salon Series at different venues in the UK and launch themselves all over the tanz hoch zwei festival at Tanzfabrik Berlin with 2 special editions of Susi & Gabi’s Salon made for and with the festival. In 2013 they conquered nottdance festival with some exciting UK artists and returned to Leicester with an all starring cast. Gabriele Reuter und Susanne Martin widmen sich auf verschiedenen Pfaden dem Phänomen der Improvisation: praktisch, tänzerisch, theoretisch, mit Zuschauerbeteiligung oder mit geladenen Gästen. Bisherige Gäste: Andreas Mueller, Rosalind Crisp, Joris Camelin, Mata Sakka, Luc Dunberry, Amost Hetz, Pete Shenton, Dog Kennel Hill, Robert Clarke, Ludger Orlok, Gisela Müller, Christa Flaig, Shannon Cooney, Rubato, Rick Nodine, Jamie McCarthy, Jovair Longo uvm..